WILEY—The remains of World War II naval battle sites can be found under water, but most have not yet been subject to archaeological investigation. A new International Journal of Nautical Archaeology study* provides precise geographic information for the preservation, long-term research, and future use of a historically important World War II battle site on the seafloor off the coast of Okinawa, Japan. “This article is not only presenting an innovative methodology for precise 3D mapping of the seafloor. We hope it also serves as a bridge to peace for both Japan and the U.S. and provides materials for future education,” said lead author Prof. Hironobu Kan, of Kyushu University, in Japan. USS Emmons (DD-457) at anchor, circa 1942. 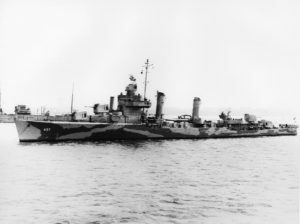 The ship is painted in Camouflage Measure 12 (Modified) U.S. Naval History and Heritage Command Photograph. *”Assessment and Significance of a World War II battle site: recording the USS Emmons using a High?Resolution DEM combining Multibeam Bathymetry and SfM Photogrammetry.” Hironobu Kan, Chiaki Katagiri, Yumiko Nakanishi, Shin Yoshizaki, Masayuki Nagao and Rintaro Ono. The International Journal of Nautical Archaeology; Published Online: June 12, 2018. (DOI: 10.1111/1095-9270.12301).